In this fascinating bouquet golden yellow Gerberas, yellow Asiatic Lilies and purple Iris are incorporated and they will for certain in unison put a smile on anybody's face. Fascinate someone today with this fantastic bouquet.Lilies may be sent closed/partially closed in order to prevent damage and to last longer - Vase not includedVase not included however; for a lasting impression we recommend you purchase a Standard Vase to perfectly complement Fascinate. It was a v easy process to book a delivery ! Was thrilled the flowers arrived so soon and instructions of which door to deliver them to was followed. 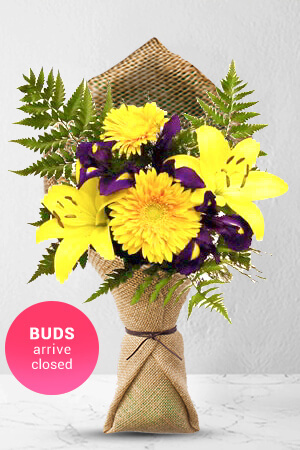 Very quick and efficient to order and my Mum loves her flowers. Flowers looked differ from picture ... however , Recipient was delighted thus I’m happy .